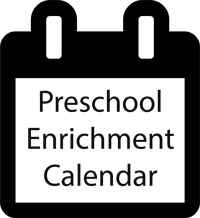 Looking for Preschool Enrichment Offerings near Willowbrook, IL? 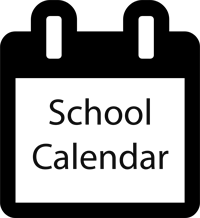 Open to students age 4 by January 1st. Math is all around us! 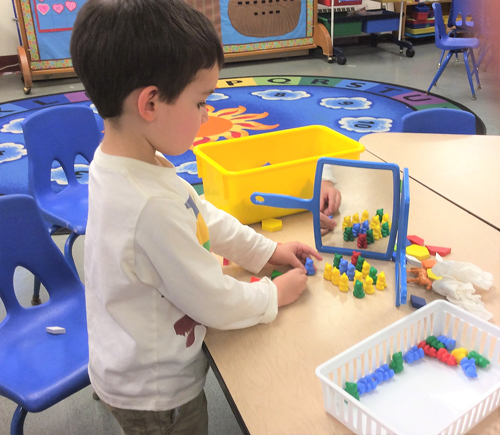 Our Discovery Math Preschool enrichment class is designed to increase children's interest and knowledge of math, building on what young children already know and are capable of doing. The curriculum will emphasize the children's role as an active learner. 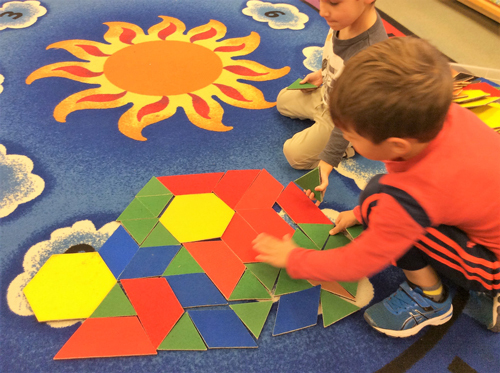 Through hands on experiences with individual and group activities, children will explore math academic areas. Through their math experiences children will meet the math standards of the NAEYC (National Association for the Education of Young Children) and the Illinois Department of Education Early Learning and Development Standards. The Everyday Math program will be used to implement lesson plans and activities. The children will experience mathematical thinking as part of their everyday lives. Number activities, including counting and number recognition, simple methods for calculating sums and differences, estimating and comparing, graphing to predict and find solutions to developmentally appropriate math questions will engage the children using their natural problem solving skills. Satisfying your preschooler's curiosity is the topic of this wonderful Discovery STEAM Preschool enrichment class! Students have the opportunity to discover, explore, observe and investigate by participating in hands-on multisensory experiences and experiments! Student's natural scientific thinking is challenged and energized with observations that are shared, collected and explored! Children will share record and share data, explore technologies and engineering methods each week. The scientific process of the steps scientists work through while conducting an experiment such as asking questions, making a hypothesis, conducting experiment and drawing conclusions are the foundations of this fun class! Book Worms is designed to increase children's love for literature and books while enriching their language arts skills and other subject areas within the Illinois Department of Education Early Learning and Development Standards. Our BookWorms Preschool class focuses on identifying and comprehending the important building blocks of literacy and language including rhymes and phonemic awareness through popular authors and illustrators. The children will focus on classic authors and their writing style; (i.e. Eric Carle, Leo Lionni, Audrey Wood, Doreen Cronin)! The children will explore language arts, art, science and math through literature. The children will also focus on classic illustrators; learn how illustrators illustrate books as well as learn to illustrate their own books. The children will develop and explore their knowledge of rhyming words and environmental words and phonemic awareness. 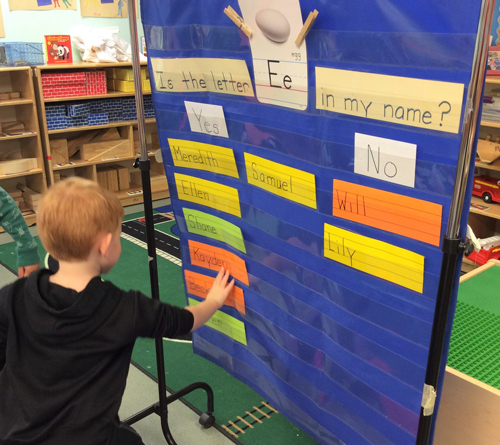 Beginning reading skills are explored through simple sight words, journaling, charting, graphing and much more! "Intellectually, art criticism introduces the process of logical and creative thinking"
La Petite Masters enrichment program is designed to develop and increase children's love for art and artistic expression though painting, sculpting, drawing and various other mediums. Children will develop a love of art through a variety of mediums as well as an appreciation and awareness of great artists from past and present. Included in this program will be opportunities for both informal and formal encounters with art. 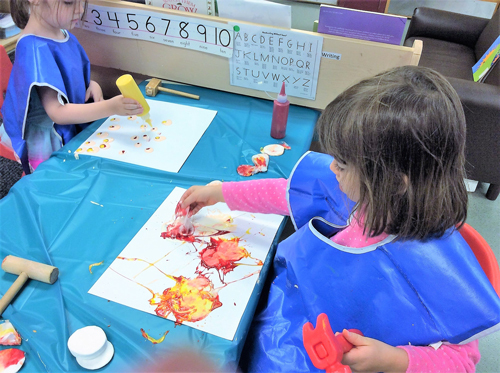 Through their classroom experiences children will meet the fine arts and visual arts standards of the Illinois Early Learning and Development Standards. Children will take what is useful to them and apply it to their everyday lives. Students will develop skills that include visual perception, critical thinking, language acquisition, vocabulary and problem solving. The will explore and appreciate the unique styles of various modern and impressionist painters such as Andrew Wyeth, Salvadore Dali, Claude Monet, Pierre Auguste Renoir, Pablo Picasso, Vincent van Gogh and many others! A wonderful class to bring out the inner artist in your child! Road Trip! Each month our students will visit a different state across the U.S.A. learning about social studies, geography, science, as well as art meeting the S.T.E.M standards for preschool. 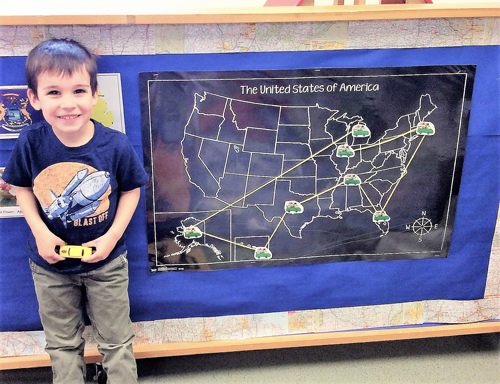 Students journey across the U.S and "explore" different locations via books, maps, cuisine, videos and art, which are brought to life in the classroom. The Science activities will channel your child's enthusiasm in a high-energy, hands-on manner through age-appropriate experiments. They might learn about simple machines and make their own cars studying Michigan (Detroit), or create and then dig their own fossils learning about South Dakota's Bad Lands. The curriculum emphasizes the child's role as an active learner and experimenter, allowing students to learn by doing. Children will be challenged and energized by this project-based class, learning by what they do best - play! The classes flow from one to another, such that a geography lesson on Florida's peninsula leads into a science lesson focusing on oceans and creating waves in a bottle. Discovery Kids Explore America puts students in the driver's seat for the literacy portions of every class by engaging all their senses to aid in comprehension. This delivers a creative experience that not only fosters an appreciation for music, poetry, drama and rhyming in literature, but also helps children develop techniques for problem solving, conflict resolution and handling emotions. Additional activities challenge students to identify and comprehend important building block language skills such as word families, rhymes, and sight words. 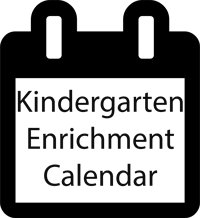 This class is project based and continues to focus on kindergarten readiness! Our most popular enrichment class! BookWorms is designed to increase children's love for literature and authors while enriching their language arts skills and other subject areas within the Kindergarten Common Core Standards. This class focuses on identifying and comprehending the important building blocks of literacy and language including word families, rhymes and sight words through popular authors and illustrators. 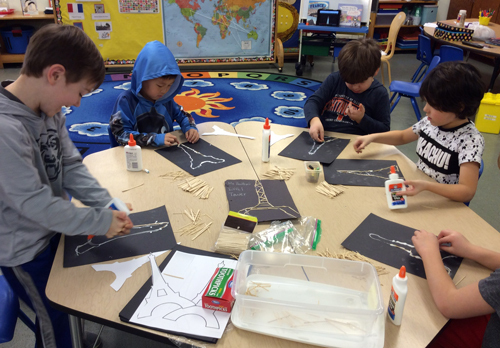 Each week, students are engaged in project-based literacy and art activities related to the chosen story. The children will develop and explore their knowledge of environmental words, sight words and rhyming words in their world. Art and illustration will be explored as the children focus on classic illustrators and learn how to illustrate and write their own books and journals. The curriculum emphasizes the child's role as an active learner and gives each student the opportunity to engage in hands on reading and writing activities. An increased understanding as well as an appreciation for the timeless arts of music, poetry, drama and rhyming in literature will be developed and explored. Science and Math activities will channel students enthusiasm in a high-energy, hands-on manner designed to boost their inherent interest and spark the imagination! The curriculum emphasizes the child's role as an active learner and experimenter, allowing students to learn by doing, and explores science and math concepts through exciting, age-appropriate experiments! Students will embark on a learning expedition, journeying across the world and recording their experiences in their travel journal. Students "explore" different locations via books, maps, cultural cuisine, art and virtual experiences which are brought to life in the classroom, sparking imagination and fostering a love for travel and culture. With each country, children will see the similarities and differences of how people live and what they experience whether it's through video, music, food, games and even doing an experiment. Critical thinking and problem-solving skills will be particularly emphasized during science. 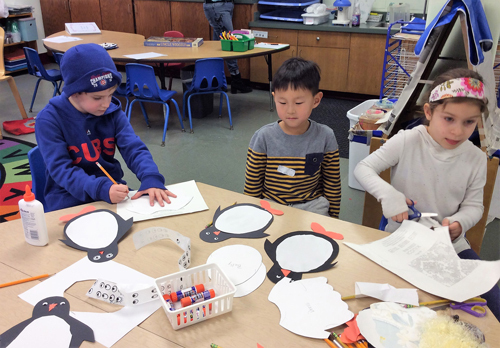 Development of overall communication and social skills are experienced through small groups and an open dialogue is experienced during circle time. This wonderful class will open up a whole new world for your kindergartener! Dad's Furniture Move-out Party - All Dad's Welcome! Interested in a Tour or to learn more?